"Hey, that's not nice! Go! Go, red team! Go, Ottawa! Go, New York! That's not nice!" This is my son's play-by-play tonight as he snuggles in with his daddy to watch the play-offs. 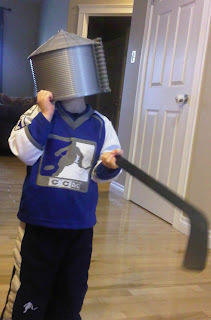 At commercial break, Little J fumbles around with his farm stuff, finds a grain bin and sticks it on his head. 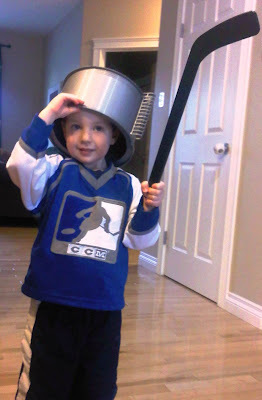 Grabbing his mini stick, he declares he is a "hockey knight." He is now galloping around the house saying, "Yee-haw!" It's great to see my guys enjoying a hockey game together. Admittedly, I'm much more interested in watching the off-screen activity going on during this "Hockey Knight in Canada." So also I would be more interested in the off-screen show. Very cute! Find pre school franchise opportunity with euro kids at your cities Bangalore, goa, pune and ahemdabad. Low cost play school franchise with the first of its kind preschools in India with international standards.